I've been a convert to motion-activated trash cans since my wife brought one into our household a number of years back. When they work, they're wonderful. They keep the stink in the can and your hands clean. The downside is, despite being a pretty simple piece of technology, they always seem to develop problems before too long. Our current one was sticking all the time and it became apparent that the mechanism had literally blown a gasket and it wasn't going to be salvageable. Time for a replacement. Until it was time to empty it. This turns out to be one of those "did you actually ever use this thing" moments. Really, Mr. Sensible Eco Living, did you? 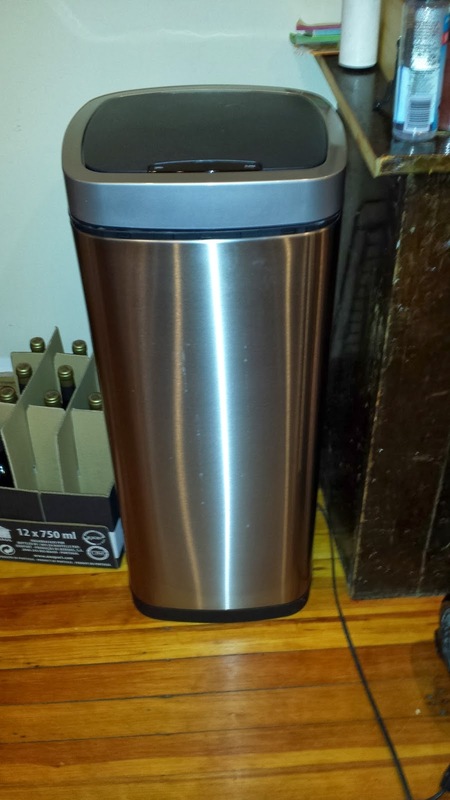 Because it turns out there's a basic design premise that every trash can abides by. One that's so obvious, you don't even think about it, until faced with the product that totally missed Trash Can Design 101. The trash can must be at least as big at the top, as it is at the bottom. This trash can has a system of two interlocking rings to hold the trash bag internally. You put the top of the trash bag through the inner ring, wrap it around the outside of it, and then pop it into the outer ring. It holds the bag securely and it doesn't stick out of the can. 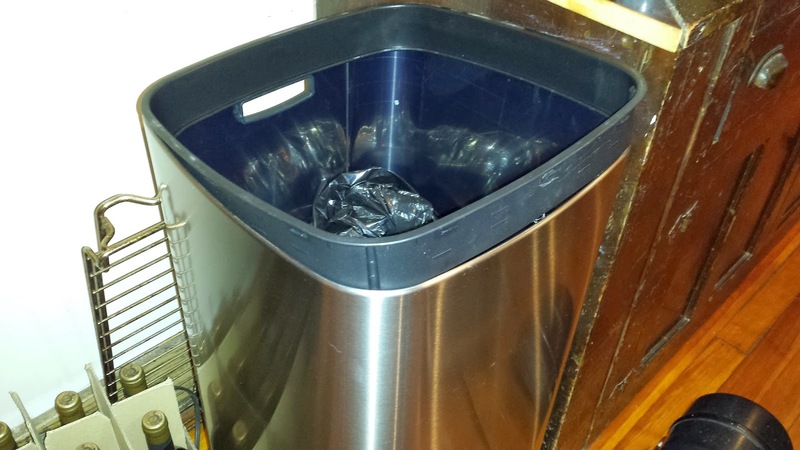 The problem is, the frame of the outer ring reduces the size of the top of the trash can by almost 1" all around. Can you imagine what happens when you try to pull a bag stuffed full of trash through this literal bottleneck. Yeah, that's right. Cursing, fist shaking, ripped trash bags, moaning, questioning, frantic googling (revealing nothing, since this seems to be a very new product), and ultimately, product hacking to fix their idiotic design flaw. How To Make It Possible To Empty This Thing? Fortunately the solution to this problem is pretty simple, and really without any downsides. Pop out the outer ring, which you probably already did in frustration while trying to get your full bag of trash out. You'll need to manhandle it a bit to get it off, but it's not brittle so you won't break it. In the picture at right you can see the ring detached from the can. There are 12 tabs around the perimeter which hold it in place, 3 on each side. There is absolutely no need to for the outer ring to be permanently attached to the trash can. Gravity works just fine. The easiest way is with a razor blade scraper tool. (Don't try to do it with just a razor blade or you'll probably hurt yourself). The ABS plastic can be cut with some effort, just make sure you use a tool that's sharp and offers you a good grip. Once those tabs are gone, you can pop out the outer ring and the inner ring effortlessly when it's time to change the trash. Thanks for the tip. I too have wondered who designed it and did they ever use it? It is annoying. I have been laying my can on its side to pull out the bag, gently moving the bag back and forth till it gets out. I have a question, though. I'm looking for the instructions that came with mine. I know I have it around since I save all that kind of stuff, but probably just haven't put it away yet. I am trying to remember what the light indicators mean. Do you have a manual or the instructions you can take some pictures of and post? Thanks.